Each stool swivels a full 360 degrees and includes outdoor seat pads in your choice of premier outdoor fabrics. Sunbrella Fabrics available at an additional charge to be added after order is placed. The pedestal table is at the ideal height for the stools and features a foot rest. The rich Bronze finished cast aluminum is easy to care for and has the look of antique wrought iron. Light assembly required. 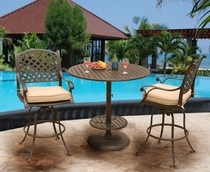 Three Piece Set includes: Pub Table, 2 Swivel Stools. Five Piece Set includes: Pub Table, 4 Swivel Stools.